Mick Snyder and Jason Scruggs continued their excellent championship duel in the American Drag Racing League's (ADRL) Pro Extreme class at Texas Motorplex, but it was Texan Frankie Taylor who grabbed the spotlight under the lights on Friday. Taylor and his Jeffers Pro Cars Corvette put together the quickest run in ADRL history and broke the world speed record, going 3.577 at 212.19 mph during the third and final qualifying session at the ADRL World Finals VIII presented by CarSafe. It gave Taylor, who holds the world E.T. record (3.581) in PX, the No. 1 qualifying spot and the speed record he had long been chasing. "We finally got that speed record. We've been after that for a long time, and it just feels awesome to put together a run like that," Taylor said. "The car was really great out the back. "It's a cool deal because this is the first 3.50 we've had this year and it just felt good to have a run like that. It's always exciting to get back out there and get another one in the 3.50s." Other No. 1 qualifiers through three rounds include Pat Stoken (Pro Nitrous), Billy Glidden (Mickey Thompson Extreme 10.5), Eric McKinney (Pro Extreme Motorcycle), John DeFlorian (Extreme Pro Stock), Pat Musi (Aeromotive Fuel Systems Pro Modified) and Joshua Vettel (Summit Racing Equipment Top Sportsman). The final qualifying session takes place at 12 p.m. local time on Saturday at the Texas Motorplex, with eliminations for the World Finals VIII presented by CarSafe to follow. Brandon Pesz started Friday in Pro Extreme with a career-best 3.587 and Tommy D'Aprile topped it with a career-best 3.580 under the lights before Taylor delivered his record-breaking run. "It was just a very smooth run. We had it stepped up a little bit and we were trying to go a little quicker, but that just cruised right down the track," Taylor said. Meanwhile, the Pro Extreme championship points race between Mick Snyder and Jason Scruggs continues to be intense. Scruggs is currently qualified fifth with a 3.613, while Snyder and the Powersource Transportation team is right behind in sixth with a 3.627, meaning Snyder will take a 5-point lead into Saturday. Pat Stoken delivered a top-notch run under the lights in Pro Nitrous, setting a huge career-best and breaking the track record in the process with a thrilling 3.769 at 198.44 mph. It's the second-quickest run in Pro Nitrous in 2012 - and third quickest in class history - and also Stoken's first visit in the 3.70s. Jim Laurita is currently second with a 3.795 at 196.73 mph in his Tim McAmis Race Cars '70 Camaro, which is a career-best for him as well. "It was just so smooth and so straight, and to run 3.76 was just really cool," said Stoken, who also thanked Reher-Morrison Racing Engines and Switzer Dynamics. "I can't say enough about that run and everyone who helped make that happen. A run like that puts you in real good company and that feels good." Of course, Bob Rahaim clinched his first ADRL world championship in the class with his car passing tech earlier in the day. Rahaim is currently qualified No. 3 with an impressive 3.804 at 198.41 mph. Stoken, meanwhile, is after his first ADRL win after his first trip into the 3.70s in his RJ Race Cars Camaro. "We've got to have a little luck on race day and we haven't had that yet," Stoken said. "This RJ Race Cars car is just great. Hopefully we can get all the pieces working together." Pat Musi is doing everything possible to finish on top in his championship chase in Aeromotive Fuel Systems Pro Modified, and his Friday got off to a good start with a 3.873 at 193.54 mph, which puts him as the No. 1 qualifier. It was Musi's second straight run in the 3.80s and gives him plenty of momentum heading into eliminations. Musi currently trails points leader Jeff Naiser by 150 points. "We're going after (the championship) and so far things are going well," Musi said. "We've got the car repeating and that's what we're after. We're pretty happy with how things went today." Mike Castellana, who trails Naiser by just 129 points, is currently second with a spectacular 3.875 at 193.99 mph in his Al-Anabi Racing 2012 RJ Race Cars Camaro. Naiser is currently not qualified, as his 4.126 currently has him 13th in an eight-car qualifying field. Naiser has one shot left to get in the field or his championship hopes will suffer greatly. The class excitement didn't stop there, either, as Clint Satterfield set a world speed record in the class, going 198.09 mph on his pass of 3.91. "This car is a handful to drive. It makes a lot of power, but the crew has been doing a great job," Musi said. "Now we just have to try to run our race, and hopefully it will all come together and we can get that win." Joshua Vettel appears on track for his second straight No. 1 qualifier in Summit Racing Equipment Top Sportsman thanks to his 4.011 at 184.07 mph in his RJ Race Cars '70.5 Camaro to set the track record. An event after breaking the world E.T. record with the first 3-second pass in the history of the class, Vettel delivered another fabulous performance to jump to the top of another loaded Summit Racing Equipment Top Sportsman field. In an interesting championship race twist, current points leader Marco Abruzzi (4.214) is currently qualified No. 9, while William Brown III, who is second in points, is No. 8 with a 4.208. If that holds up they would meet in the first round, which would have huge championship implications. Brown currently trails Summit Racing's Abruzzi by 278 points. Ronnie Davis, who is third in points and still has a shot at the championship, is currently qualified third with a strong 4.094. Eric McKinney has already wrapped up his world championship in Pro Extreme Motorcycle, which is his first world title in the ADRL, but he remains as dominant as ever in Dallas. Through three qualifying sessions, McKinney is the No. 1 qualifier, running a 4.068 at 174.73 mph, putting him in a familiar spot. "We came down here with the same mindset we always do, and that's to try to win the race," McKinney said. "We might have the championship wrapped up, but we want this one, too, and we'll do whatever it takes." 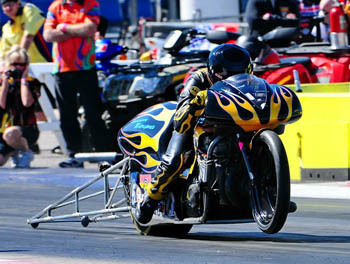 Dave Norris is right behind with a 4.077 at 171.71 mph, but McKinney is gunning for his fifth straight win to end the year, seventh overall and a possible ninth trip to the finals in an unbelievable 2012 campaign. "We would love to keep that streak going," McKinney said. "Everybody wants to win the last race of the year, but it's going to be tough. Anything can happen and there's a lot of good guys out there." 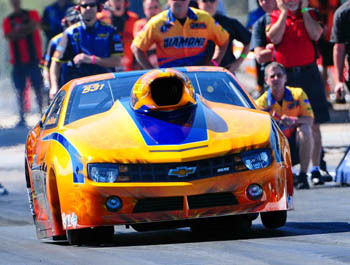 In his 2012 Camaro from Jerry Haas Race Cars, John DeFlorian improved his world speed record in Extreme Pro Stock, going 179.95 mph. It's also enough to give DeFlorian the No. 1 qualifying spot, thanks to his impressive run of 4.04. If it holds, it will be DeFlorian's fifth No. 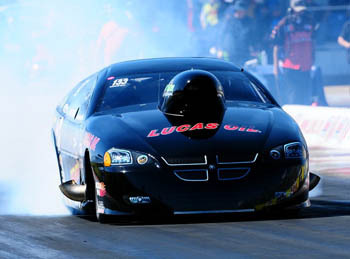 1 qualifier in an excellent 2012 season, his first in Extreme Pro Stock with the Black Diamond Motorsports team. "Coming down here, I thought we could go 180 mph and I still think we can," said DeFlorian, who also thanked Sonny's Racing Engines. "The weather has been consistent and conditions are exceptional out there. We couldn't be happier. "Sonny's have given us great power and the car is working really well. This team is amazing and the guys just work their tails off." 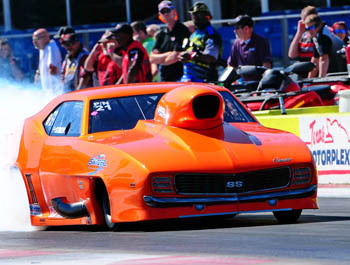 Pete Berner and his Summit Racing team are currently qualified second with a 4.051. Cary Goforth, the current XPS points leader, is third with a 4.055 at 177.32 mph in his Jerry Haas Race Cars GXP, putting him closer to a second straight championship. Richie Stevens Jr., who is second in points, will need a spectacular Saturday to make up the current 435-point gap. Stevens and the CarSafe team are currently qualified No. 9 with a 4.075 at 177.07 mph in their Jerry Haas Race Cars Mustang. 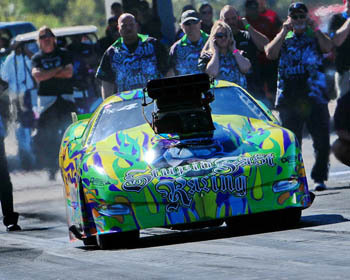 In Mickey Thompson Extreme 10.5, Billy Glidden, who is seeking his ADRL-record 15th career win, is currently qualified No. 1 with a 3.915 at 190.59 mph. Alan Pittman clinched his first ADRL world championship earlier in the day when his car passed tech. He is currently qualified No. 2 with a 3.948 at 197.19 mph. Fred Henson is the top qualifier in the SuperCar Showdown, going 5.843 at 118.49 mph in his 2013 Ford Cobra Jet. In Pro Junior Dragster, Kyle Dvorak is the current No. 1 qualifier with a 7.906.